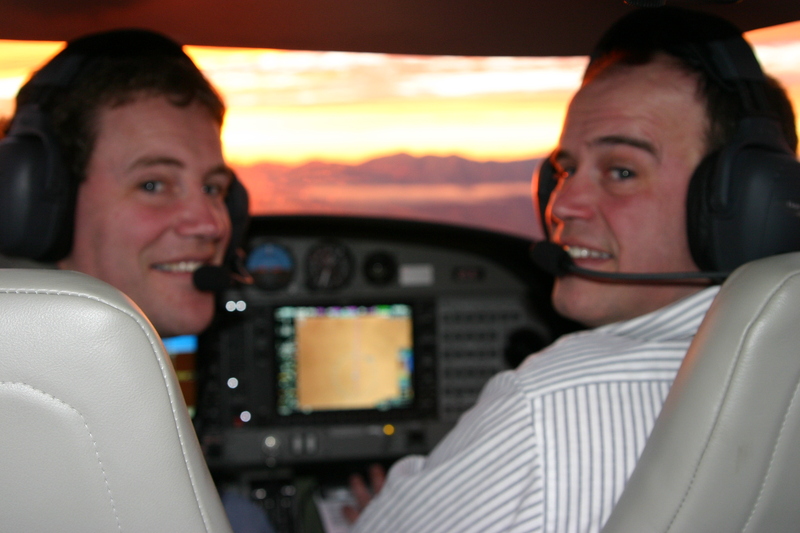 Here are two happy fellows headed into the sunset after a very nice trip to Las Vegas. 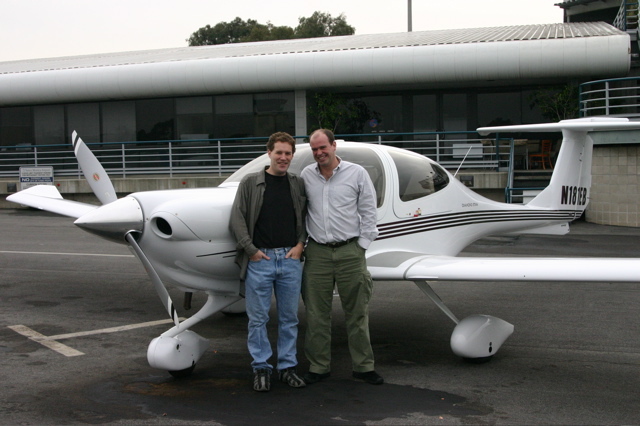 I went to Long Beach and flew a DA-40 up to Colin at SMO. The landing was perfectly acceptable considering it was my first attempt at getting a DA40 on the ground since my fifth week of training. Colin jumped in and we headed for North Las Vegas. Colin let the GPS fly the plane along a preset route. It was interesting to just sit there and let the plane fly, but I still enjoy the hand flying thing. After several adventures we took off from North Las Vegas to Boulder City. What a nice little airport that is. There are three Grumman Albatrosses. 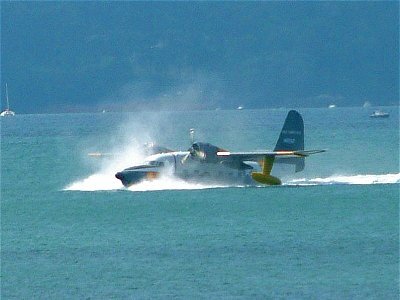 Great big seaplanes that make me want to jump in and start across the Pacific. We were met at the airport by Colin’s site foreman for the castle. Bob whipped us over and I got to see the job site for the first time. It is absolutely stunning. The sheer size of the place is daunting, but as I wandered from room to room I was blown away by the details. The juxtaposition of walls against mountains, the sight line as you walk towards the guest rooms, and the majesty of the ‘ballroom’ view were just outrageous. I can’t imagine it springing from my head and I am completely knocked out that not only did it spring from Colin’s head but that he still has a good deal of it up there. How does it fit? We got back in the plane and headed back to Long Beach straight into the sun. There are times when a little piece of black plastic would be very nice in an airplane. This is one of them. The flight back involved a ton of hand flying since I had pretty well wrung out the Garmin 1000’s and was ready to do some stick work. There was a bit of turbulence, and just as in the Cessna 172 it is a smoother ride with a hand on the stick than an autopilot. Even a good one like the KAP 140. Colin landed at Long Beach after dark, a nice smooth drop in that seemed unaffected by the night. We could not go back to SMO so I drove Colin home. What a nice flight.